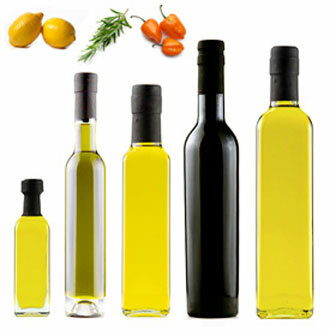 Are you looking to launch a new line of your own branded olive oil or vinegar? Can you spare five minutes to source the product, bottles, and closures instead of dedicating months of research to find what you need? The Olive Oil Source, the industry leader in olive oil-related products, debuts its simple, interactive Create Your Own Oil or Vinegar Shiner for specialty food retailers and marketers. In just a few minutes, in 5 simple steps, you can source immediate availability of high quality olive oils and vinegars and rapid turn-around production for your own branded products. Create Your Own Oil or Vinegar Shiner features a full line of extra virgin olive oils and vinegars, including certified organic, Kosher and specialty flavored options. At the foundation of the program is the ability to create custom “shiners”, or unbranded bottles of olive oil or vinegar through a simplified online process. Similar to the wine industry’s approach to bottling wine for later rebranding, the new program includes more than 100 olive oils and vinegars to choose from. Retailers are offered three options for branding: order shiners without labels; have the Olive Oil Source adhere company labels to the products; or simply add a personalized message to the Olive Oil Source’s label. A wide variety of bottle styles and sizes provide complete flexibility to the customer. Online pricing and ordering make this an industry first, bypassing the typical “call us for more information” sites that hint at the service without providing detailed information upfront. Another significant advantage of the program is its low minimum case requirements, allowing customers to conduct their own in-store tests with flavor and sizing options. If you are looking to expand your own brand, Create Your Own Oil or Vinegar Shiner presents a perfect opportunity for specialty food store owners or olive oil tasting bar entrepreneurs to fine-tune their own product offerings to fill in the product line gaps or present a cost-effective self-branded option to their customers.